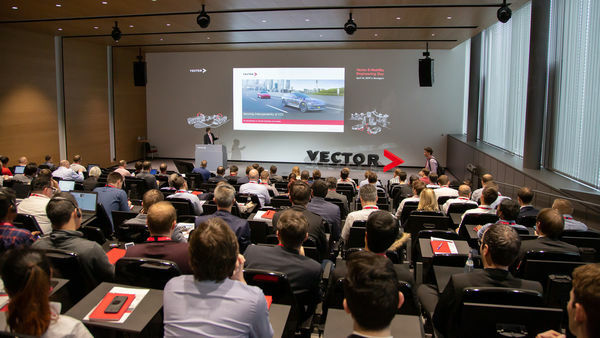 On April 16, 2019, the 6th Vector E-Mobility Engineering Day took place at the Vector Campus in Stuttgart. 138 international participants met to exchange experiences with leading experts from industry and science on new technologies, standards and trends in e-mobility. Together with Vector experts, the participants of the workshops learned how to perform automated conformity and interoperability tests of communication between electric vehicles and charging stations according to DIN SPEC 70122 and ISO/IEC 15118-4. The breaks were used for intensive discussions and to learn more about the e-mobility solutions of Comemso, Scienlab/Keysight, the IEW of the University of Stuttgart, Verisco, CSM, P3 Systems and Vector at the accompanying exhibition. We would like to thank all participants, especially the speakers and exhibitors, who contributed to the success of the event. Presentations now available for download! Chris D’Souza, Shell International Petroleum Co. Ltd.